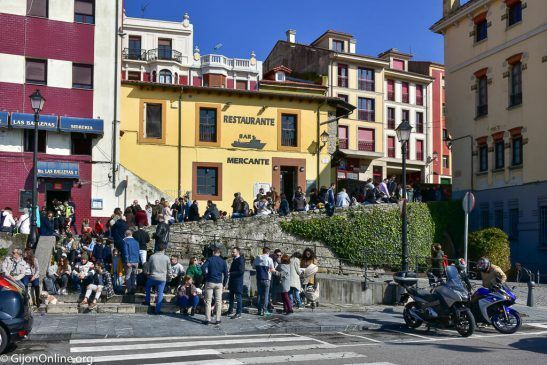 Cimavilla (or Cimadevilla) is the old town of Gijon and used to be the whaling and fishing quarter. 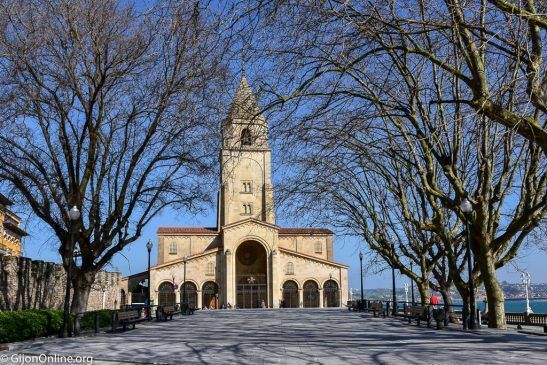 The origin of this charming part of the city goes back to the Roman times. Famous landmarks are still standing nowadays such as the remains of the Roman wall or the Roman baths. 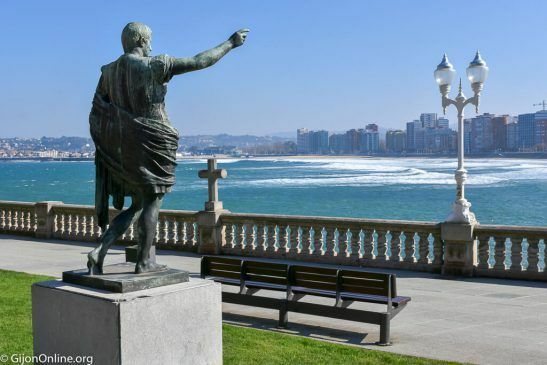 The Gijon Marina on one side surrounds Cimavilla and the Santa Catalina Hill on the other. 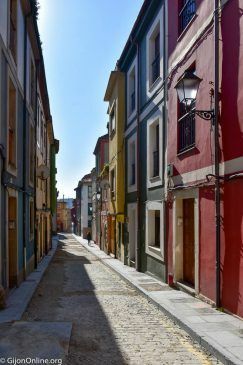 The narrow streets with typical cider taverns (sidrerias) and colorful houses offer the visitor a quaint atmosphere to explore. 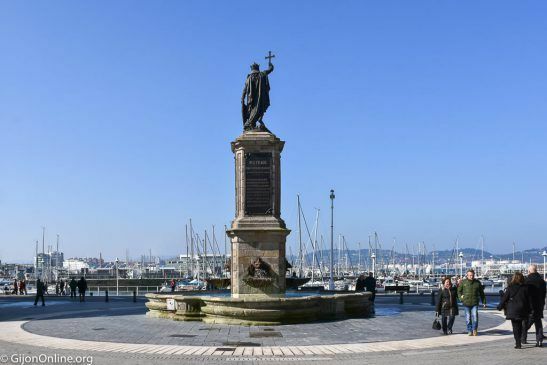 Starting at the central jetty by the Marina, we find the Tourist Information Office of Gijon, Infogijon, and head towards the so-called Gardens of the Queen, Jardines de la Reina. One of the many bicycle lanes in the city crosses the area. 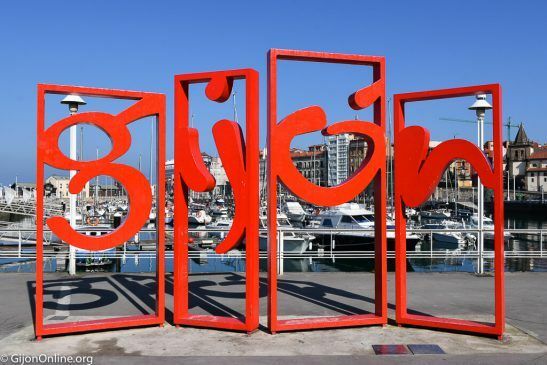 You will find there the iconic outdoor sculpture formed by the giant letters of Gijon in bright red, Las Letronas, which have become an attractive landmark over the years. 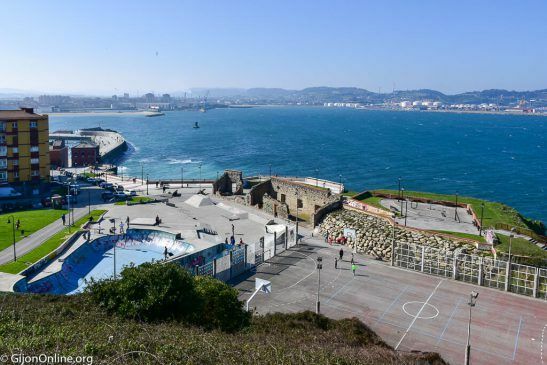 From there we can appreciate beautiful views of the Gijon Marina (Puerto Deportivo) and the Marquis Square (Plaza de Marques). 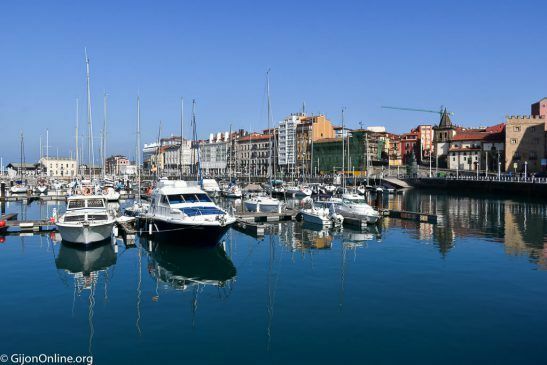 Some of Gijon’s visitors arrive with their boat to this Marina where it is possible to rent a berth with a wide range of additional services. Cimavilla is in front of you in all its splendor! 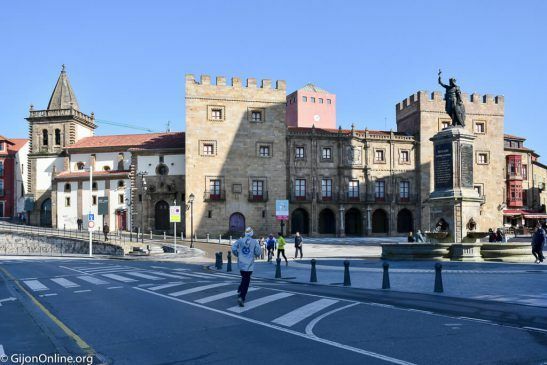 The next step ahead is Plaza del Marques with a fountain decorated with a statue of Rey Pelayo, the king, as well as an impressive palace (Palacio de Revillagigedo) and a collegiate church (Colegiata de San Juan Bautista) by its side. 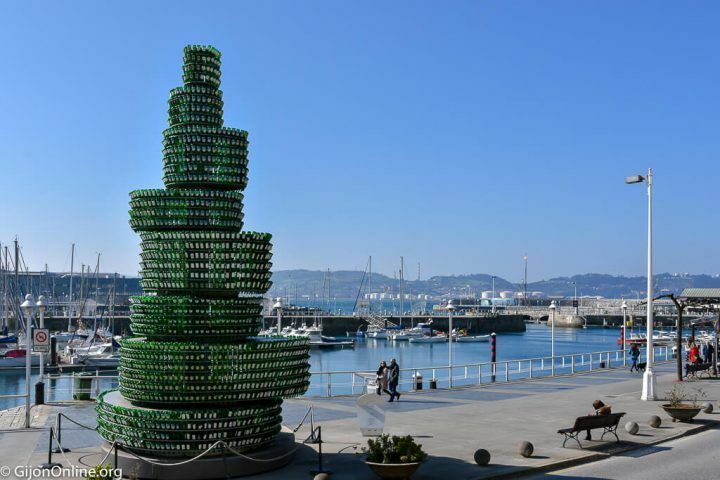 If you continue walking by the Marina, the green sculpture made with recycled cider glass bottles stands out. This Arbol de la Sidra (the cider tree) is an homage to the cider tradition in Asturias with Gijon being the council with more cider producers in the region. 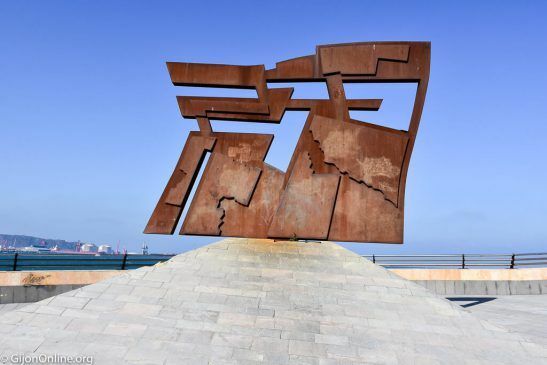 Further ahead by Claudio Alvargonzalez you will find the old dock (Darsena Vieja) on your left housing the offices for Gijon Marina, and one of the municipal museums with temporary exhibitions. While on the right you will see an uphill street, Cuesta del Cholo. 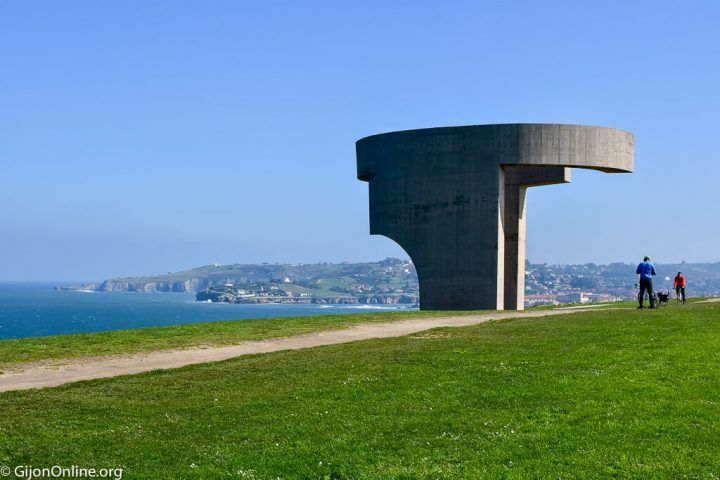 It is a known spot in Cimavilla to drink a cider or two while watching the sunset by the Gijon bay. 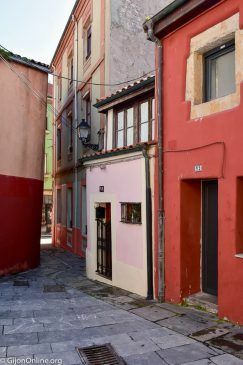 We head now uphill by Artillery (Calle Artilleria) towards the Santa Catalina Hill. You will find yet again another of the many outdoor sculptures that characterize Gijon (Nordeste, by V. Turcios) and pass by the old watchpoint with some ancient cannons (Atalaya). 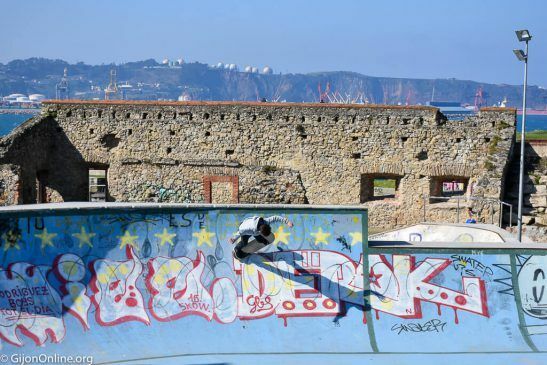 There is as well a skate park with youngsters usually practicing their acrobatics on skates. Continuing up the hill by Cerro de Santa Catalina you reach at the top the gigantic sculpture Elogio del Horizonte by Eduardo Chillida. 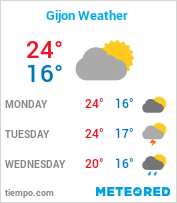 Actually, this is the symbol of the city of Gijon. 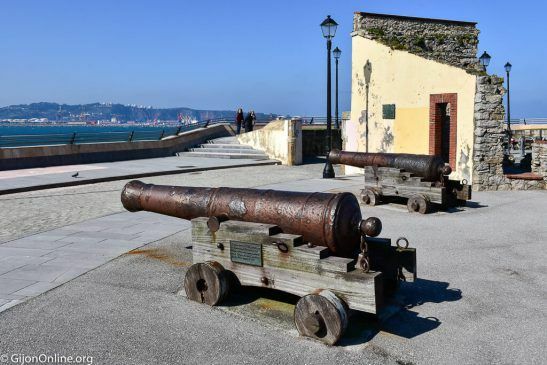 The whole area houses the remains of the bastions that used to defend the town from sea invasions. Please be careful by the cliff and extreme caution with kids! The sea views are stunning. It is the highest point in Cimavilla. 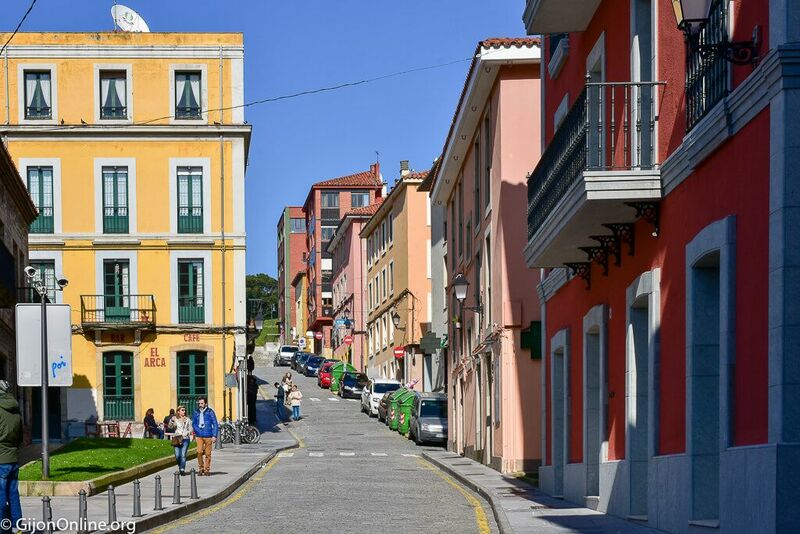 If you continue the opposite direction, you will see the Bay of San Lorenzo and start heading downhill towards Iglesia de San Pedro (Saint Peter’s Church). You will find on one side of the square the sculpture of Roman Emperor Octavius Augustus and the entrance to Museo de las Termas Romanas de Campo Valdes (Museum of the Roman Baths). 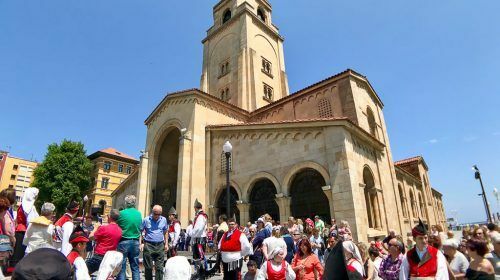 Walking opposite to Saint Peter’s Church for approximately 200 meters you will find the Plaza Mayor with the Gijon Town Hall. 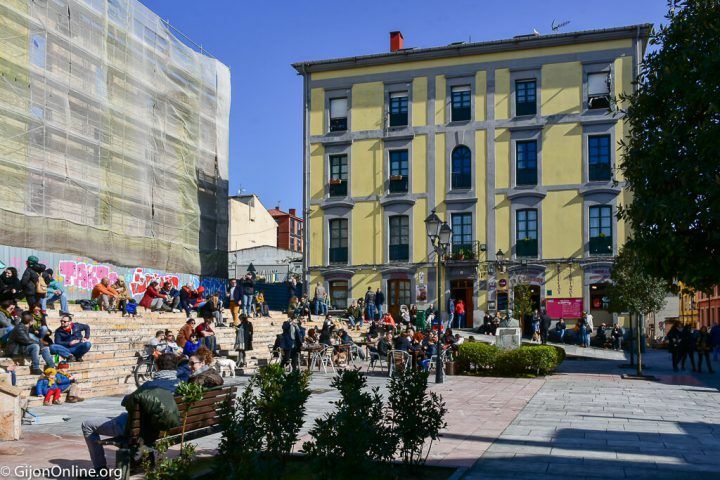 This square in the center for many events such as the monthly Artisan and Ecological Market or the concerts for the yearly Gijon Sound Festival in April. 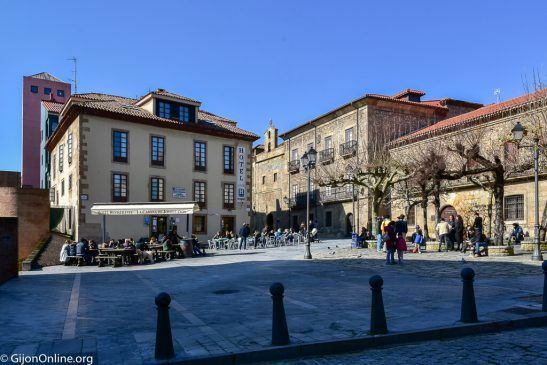 Behind this main square and up the hill, you will find another square, Plaza de Jovellanos, with many landmarks such as remains of the Roman walls, the Casona de Jovellanos with its outdoor terrace, the Museo Casa Natal de Jovellanos (Jovellanos Museum) and the Capilla de los Remedios. 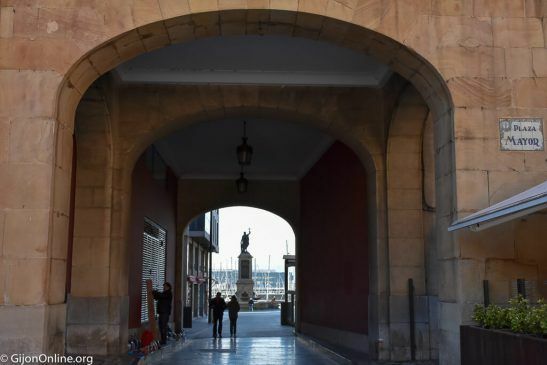 This nowadays museum was the birthplace of Gaspar Melchor de Jovellanos, an illustrated writer, jurist, and politician of Gijon born in the eighteenth century. 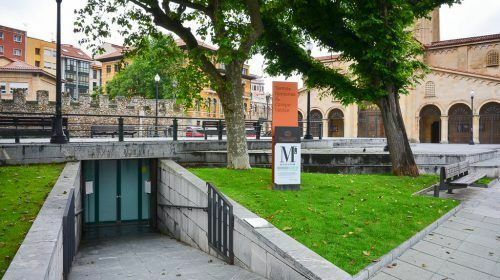 If you continue uphill with the Jovellanos Museum on your right, you arrive at Journalist Arturo Arias Square. 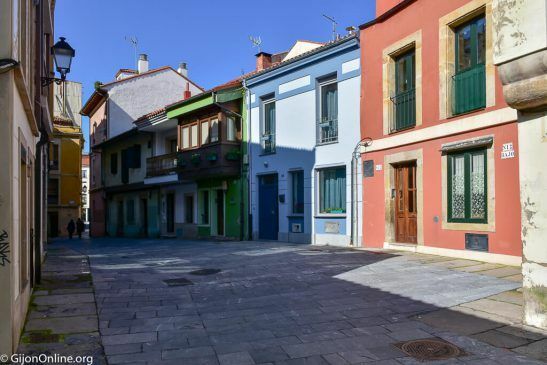 This spacious square in Cimavilla is also known as El Lavaderu. 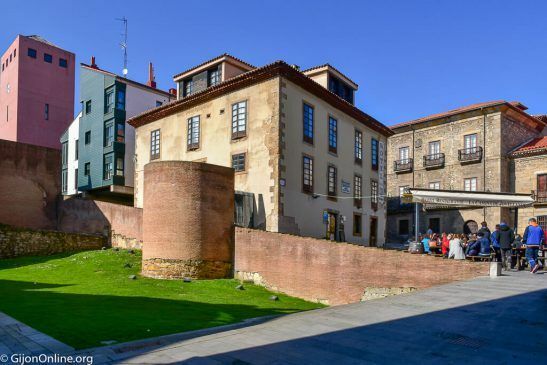 It hosts an ancient building under renovation named Antiguo Convento de Recoletas. Firstly, it used to be a nunnery, then an old tobacco factory and there is even an underground Roman cistern. 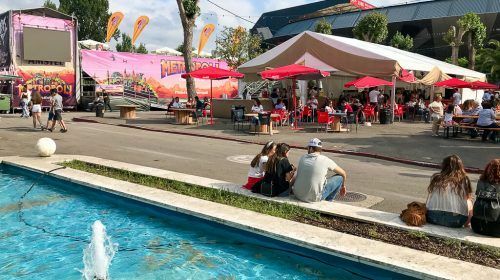 There are traditional cider houses around such as Sidreria La Tabacalera where you can taste authentic Asturian cuisine like cachopo. This recipe consists of breaded fillets joined together and stuffed with cheese and ham. It is a dish that can satisfy the most hungry stomach! Behind La Tabacalera, you will find many charming side streets full of colorful fishermen’s houses. 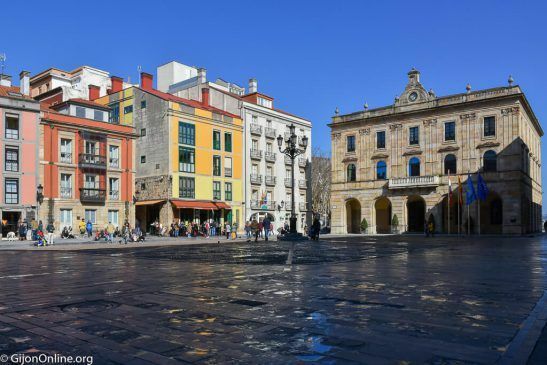 Some examples are either Calle Vicaria and Calle Atocha, also Plaza de la Soledad. It is on this last one, where you will find the so-called Casa del Chino (the Chinaman’s House). 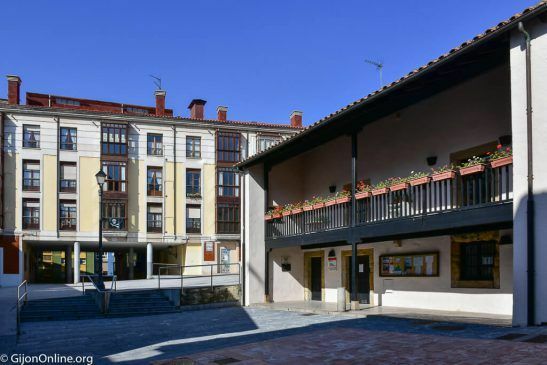 This traditional house with a large balcony used to be the Town Hall back in the sixteenth century. 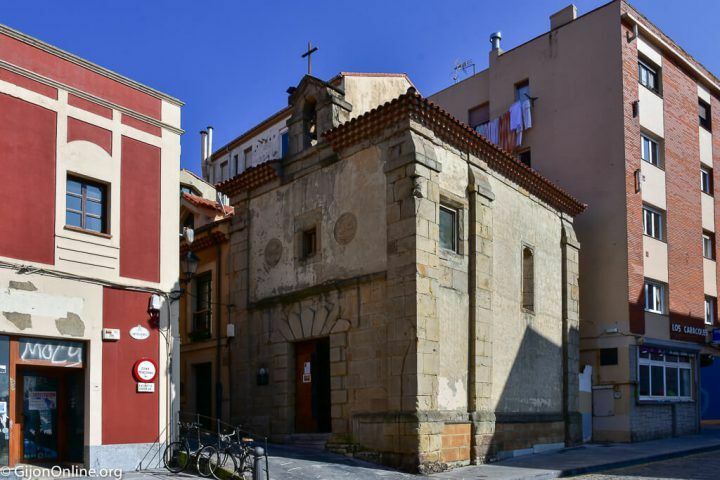 It owes its name to the fact it was the first Chinese inn of Gijon. The cultural influence remains as Cimavilla is known for decorating its streets with paper decorations and lanterns for main festivities. Going downhill by Calle Soledad you reach the Capilla de Nuestra Señora de la Soledad. The small chapel built in 1674 and venerated among seafarers and fishermen in Cimavilla. 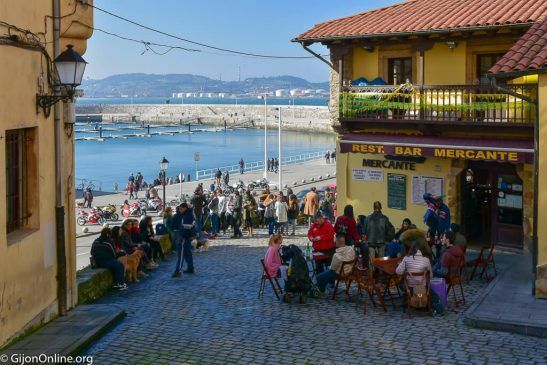 From there you can explore the many restaurants and bars trendy in the Gijon nightlife. 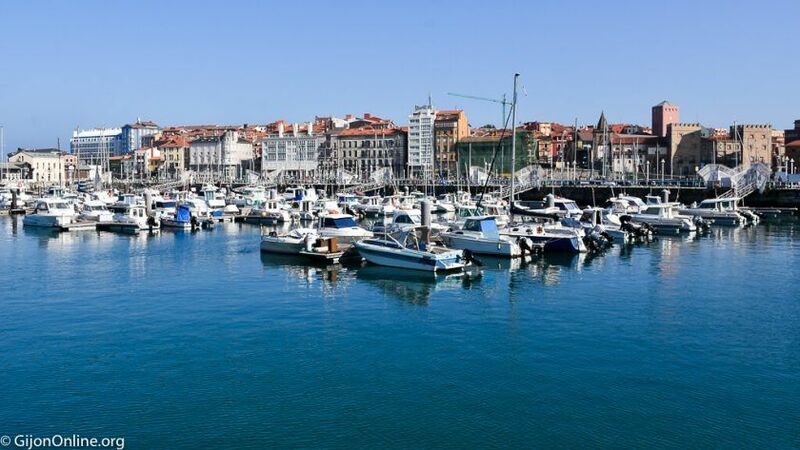 Otherwise, you can also head down back to the Marina to continue discovering Gijon. A city blessed by the sea! 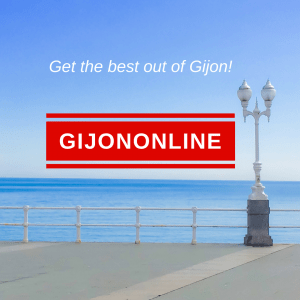 Enjoy and get the best out of Gijon!